Are Swim Spas A Good Investment? Posted on November 23, 2018 November 16, 2018 , in Swim Spas. Many people wonder if swim spas are a good investment and question if it would be a good purchase for them. The answer is not always simple because it really depends on what type of lifestyle that you live in order to know if they would benefit you or not. If you are looking for something that can help you health wise or if you are a person who likes to lead an active life, if you believe in healthy living, relaxing and enjoying quality family time, then a swim spa might be perfect for you. Keep reading below to find out why swim spas can be such a great investment. Swim spas are a challenging form of exercise. With their stationary current, users can adjust their workout level and swim in place without having to turn around and do laps. Aquatic exercise is an excellent option for those that need a form of low-imact exercise or are tired of the regular gym routine. 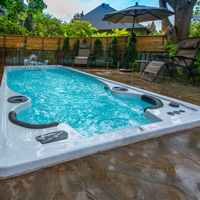 As most swim spas have split designs, one half of the spa is similar to a hot tub. Here, users can enjoy taking a leisurely soak, receive a targeted hydrotherapy massage and help soothe anxiety and stress away. If you want an investment that can be an outlet for activity and leisure recreation, a swim spa is an excellent investment. Everyone loves a pool and everyone loves a swim spa even better! They are a perfect way for your family to stay active and spend quality time socializing together. If you enjoying hosting and entertaining, your guests will love coming over for a BBQ and being able to jump into your swim spa to chat and spend time with others. Having a swim spa can help increase the value of your home. This is typically because it is considered a lavish extra and it can add more ways for you to utilize the way you live. Having a swim spa can help you to enjoy your home, use your yard more and give you the desire to spend more time outdoors and with family and friends. Even though buying a swim spa can seem like a huge purchase, there are so many advantages. Consider all the factors of how a swim spa could add to your life, how it can improve your health, increase the value of your home and can increase quality time spent with family and friends to make your decision. Now that you know why so many people find swim spas a great investment, download a buyer’s guide to learn more about their features.